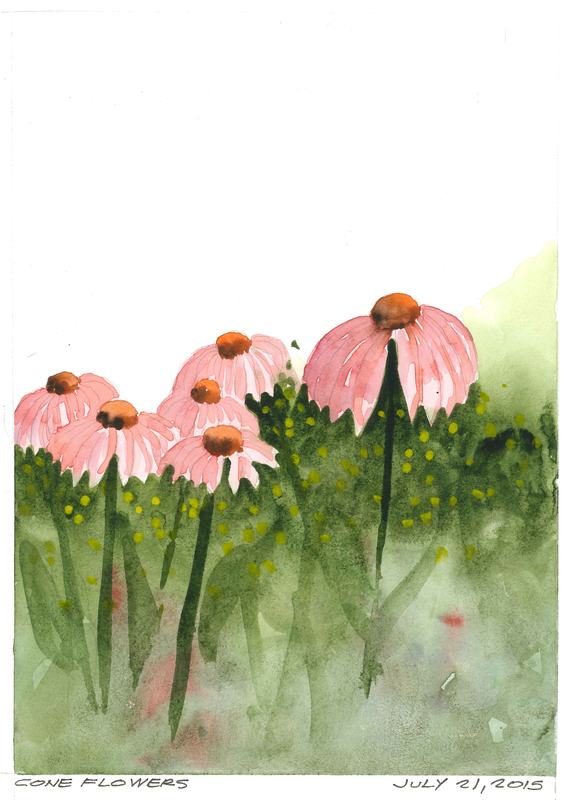 A quick watercolor of some of the Cone Flowers in our garden. They are so bright and cheery along with the Black Eyed Susan. The Coneflower is a native North American perennial sporting daisy like flowers with raised centers. Widely renowned as a medicinal plant, coneflowers are a long-flowering perennial for borders, wildflower meadows, and prairie gardens. Blooming midsummer to fall, the plants are relatively drought-tolerant and rarely bothered by pests. The flowers are a magnet for butterflies, and the seeds in the dried flower heads attract songbirds. Holbein watercolors in a Stillman and Birn Alpha Sketchbook.